So my last lecture for 2017 was titled “Why I love Anthropology” and it was a summary and synthesis of many topics we covered, with an aim towards proselytizing my discipline. I started by telling the students why human evolution is such a central issue in anthropology, and I began with Stanley Kubrick’s 2001 A Space Odyssey. The beginning of the movie portrays the moment in time when hominids make the mental leap to using tools (as shown above) – the scene was inspired by the prologue in Arthur C. Clarke’s novella of the same name and Clarke himself was inspired by Raymond Dart’s archaeological finds in southern Africa, most notably the Taung Child and his Killer Ape hypothesis. Dart believed the principle mechanism driving human evolution was aggression and violence – he once wrote that “the loathsome cruelty of mankind forms on of his [their] inescapable characteristics”. We know now that many different factors drove our evolution, but I don’t blame him for feeling this way in the mid-20th century, in the shadow of the atrocities of WWII. But I love anthropology (and science in general) because we form ideas, make hypotheses, test them, and rework from there. There are actually many different ideas about what drove hominid evolution – some scholars think food sharing, which provided a buffer from famine, forced us to communicate, and required broader kin and family affiliations, was the driving force in hominid evolution. We were certainly bipedal quite early, a prerequisite for carrying food long distances (since you’d need to be upright and use your hands to carry food). So maybe being aggressive Alpha males/females wasn’t the most important factor, but perhaps, sticking around to care for others and share food was. I love making this point to my students, who perhaps have thoughts of chimpanzees running through their heads (and not bonobos, who are as similar to us, and far more peaceful). Some might say that caring for the elderly is what drove our species forward (as if there were such a thing, evolution not being teleological or anything), since keeping the elderly alive would allow them to care for the young, while the parents foraged and hunted. This practice decreases birth-spacing, allowing populations to expand significantly quicker. It is likely that many different factors drove our species forward, but I try to make sure my students understand that studying the development of hominids helps us understand the context of our evolutionary adaptation, which is critical to understanding our behaviors as a species today. In my lecture, I asked my students, rhetorically, what does it mean to be human? I started with this question and I used it to transition from paleoanthropology to archaeology, using the earliest forms of art (Chauvet, Lascaux, Southern African rock art, carved ochre) to broach the issue of behavioral modernity and the building of the first temples. Gobekli Tepe is one of the world’s oldest temples, built before agriculture and cities, with a fascinating array of T-shaped pillars and animistic art depicting vultures and scorpions, among other images. I use this early, epipaleolithic temple to ask my students what makes us human? Is it our art? Our cities? Our belief in the cosmos? Some scholars think animals depicted on the pillars represent astronomical alignments. What is certain is that temples, like this one (and others around Turkey with similar pillars), arrived well before agriculture and cities. So is it our beliefs? After this, I jumped pretty quickly through time after the development of agriculture – I mention fortified cities like Jericho and the effects of the Neolithic Revolution sweeping through Europe, including the development of henge monuments, barrows, and cairnes. 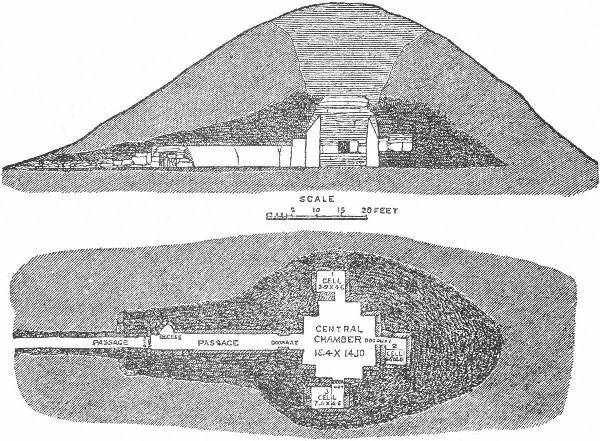 Since monuments are an interest of mine, I talked about Maeshowe, and the building of earthen mounds over large standing stones, similar to those found on the Salisbury Plain in England (Stonehenge). One of the coolest features of Maeshowe is the Viking graffiti inscribed on the interior walls, written thousands of years after the monument was first constructed (it was as vulgar as modern graffiti). I use the graffiti to return to the concept of art and how from an evolutionary perspective, humans were modern for over a 100k years before we have evidence of any art at all – this is called behavioral modernity and it is an important question in anthropology and archaeology. Did our bodies evolve first and then our minds? If not, why don’t we have art older that 100kya? From Maeshowe, I transition to Mexican street art, graffiti, and Aztec gods, like Mahahuel, goddess of maguey, agave, and pulque, the fermented drink of the gods. This is my window to talk about the Aztec pantheon, Hernan Cortez and Spanish colonization of the New World, drinking pulque as Las Duelistas, and why archaeology and anthropology help us understand a world untouched by Europeans for 15k year, first colonized by ancient Siberian populations when the world was still covered in ice. From the Aztec massacre to King Philip’s War to Ghost Dance (Wovoka), I talked to my students about the civilizations built by indigenous peoples and how they were destroyed at contact, only to re-form later as modern Nations and Tribes like the Chickasaw, Cherokee, Natchez, and others, many of whom were later removed through Andrew Jackson’s policies. I talked about successful uprisings like the Pueblo Revolt and failed rebellions like the Natchez Revolt and the German Coast Uprising (wherein a Louisiana militia, unrestrained by any government, killed the leaders of an African slave mutiny). I ended with Jason DeLeon’s heartbreaking and humanizing service to the victims of undocumented migration into the United States. It’s a sober look at how archaeology, anthropology, and service combine to bring the stories of individuals suffering under oppressive regimes to light. And I think his work is a great way to ask ourselves about our evolutionary heritage – are we Raymond Dart’s violent, killer ape, or are we food sharers and cooperators? Are we caring for our elderly or are we the killer animals Dark envisioned? Anyways, this is how I ended my 101. I’d love to hear how you ended yours.